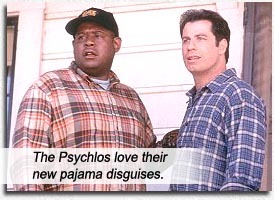 Long before John Travolta and Forest Whitaker turn Earth into a battlefield for L. Ron Hubbard in BATTLEFIELD EARTH, the Psychlos envoy (Travolta and his mildly-retarded lieutenant, Whitaker) inhabit a small midwestern American town, pretending to be human, in PHENOMENON. On his 37th birthday, Travolta sees lights in the sky – L. Ron Hubbard beaming down brain juice from his spaceship – and gains telekinesis and heightened learning capacity. With his newfound powers, Travolta still can’t find an inane excuse to dance in this film – maybe it was those 15 inch disco heels coupled with earth’s high gravity? Robert Duvall is the town doc, Brent Spiner beams down from Enterprise D to make a cameo and Kyra Sedgwick is the shovel-mouthed human female that Travolta tries to mate with to spawn mini-Psychlos. He somehow gets the idea that to impregnate her, he must buy her homemade chairs. I guess she gave him that idea by cutting his hair so sensuously. Travolta finds that L. Ron giveth and L. Ron taketh away – as he was blessed with his powers of hyper-intelligence and the ability to absorb books like Spongebob Squarepants absorbs seawater – he was also cursed with aging too quickly. He dies, having brought Scientology to Iowa, and rises to join the mothership. Phenomenon! De doo do-do-do. Phenomenon! De doo doo do. Phenomenon! De doo do-do-do, de-do-do, de-do-do, de-do-do – duh-duh da da da-da DA! Starring: John Travolta, Kyra Sedgwick, Forest Whitaker, Robert Duvall, Jeffrey DeMunn, Richard Kiley, Brent Spiner, Vyto Ruginis, Bruce A. Young, Michael Milhoan, Sean O’Bryan, David Gallagher.